The hour hand blankly moves, in spite of the dangling minute hand with a loose screw. In a society where emotional restraint is prized, interactions can all of a sudden grow stilted or become suffused with a great silence as disappointment sinks in. 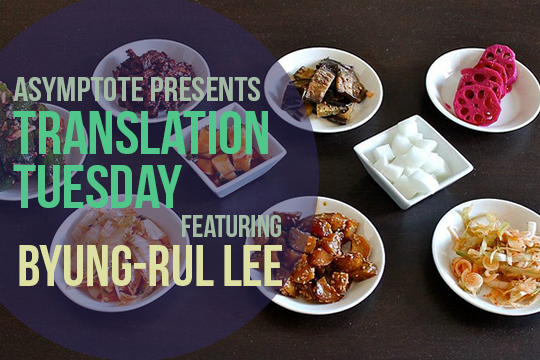 In these exemplary poems by Korean poet Byung-rul Lee, tone and imagery hint at the emotional tumult hidden underneath the surface. Truly, an emotion the size of a single juice pack. Something is stuck and will not come out. that do not fall off or get brushed off, even when shaken. in spite of the dangling minute hand with a loose screw. A metaphor hidden in the naked flesh of the picture. I cannot give up this abyss. I would have to measure to see if I can take it out again. this sadness, seared by fire, does not fall off. please, anybody, share some wine with my brothers.